Rich Mountain Road offers an alternative way to leave Cades Cove if you want to take a break from the traffic. It’s a one-way, 7-mile journey on a twisting gravel road that leads north out of Cades Cove and ends in the town of Townsend. The road winds through quiet forest that often features excellent opportunities for wildlife viewing and nature photography. The Smoky Mountains are one of the most visited natural areas in the country, and there’s no denying that during the busy seasons the traffic on the main thoroughfares can get a little thick. Thankfully, there are several quieter, less traveled roads that you can find throughout the area that offer some of the same opportunities for scenic vistas and wildlife-watching opportunities. 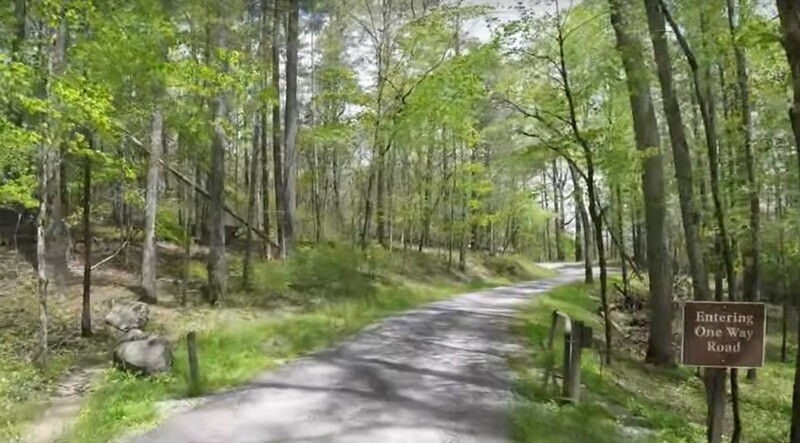 Despite the fact that it is easily accessible from the popular Cades Cove, Rich Mountain Road feels far away from the activity of the national park, and more like a secluded nature preserve. It’s one of the most unfrequented areas of the park that is open to public car traffic. The winding road passes by waterfalls, streams, and cliff sides as it travels up Rich Mountain and down the other side toward Townsend. There is also a scenic overlook on the road that provides an outstanding view of the Primitive Baptist Church in the valley below. It’s a signature view of Cades Cove, so have your camera at the ready. Rich Mountain Road is more primitive than many of the main paved roads in the park, so there are some issues you need to be aware of depending on the conditions. The road is covered in gravel and usually suitable for all passenger vehicles, but heavy rains for an extended period of time can render parts impassable for some or all vehicles. You can inquire about the current conditions with a park ranger before traversing the road. Additionally, the road is seasonal, and is usually open from April through mid-November. Buses, RVs, vans longer than 25-feet, and vehicles towing trailers are always prohibited on Rich Mountain Road. There is plenty to see in Gatlinburg, Pigeon Forge, and the other busy areas of the Smokies, but sometimes you want to get away and see a different side of the region. Not only is Rich Mountain Road a lovely quiet drive, but it also leads directly into Townsend, which is a charming town that gets a fraction of the visitors of its neighbors. This western end of the area is sometimes known as the Peaceful Side of the Smoky Mountains, and it can be a great respite if you’re looking to get away for a bit. Rich Mountain Road, Townsend and the entire area are just a short drive from our cabins in Wears Valley.